The God Bless Graffiti Coalition, Inc. was founded in 2000 in Chicago in order to combat growing national and international anti-graffiti trends. In 2002 we first published our Give Graffiti the Thumbs Up brochure (download the front and back) to help educate the public about the truth of graffiti. Tens of thousands of copies of this brochure have been distributed around the world. The success of our initial brochure has led us to expand our activities, including subway ads and our latest endeavor, graffiti bible tracts. See more on the project website. GBGC was disolved in 2005. Dispensing with Formalities, Acme Art, Columbus OH, July 2002. ‘Spacemakers‘ at Lothringer 13, Munich. 2004. The Interventionists at Mass MoCA. North Adams, MA. 2004. See documentation and the original call for participation that solicited over 300 contributions from all over the world. 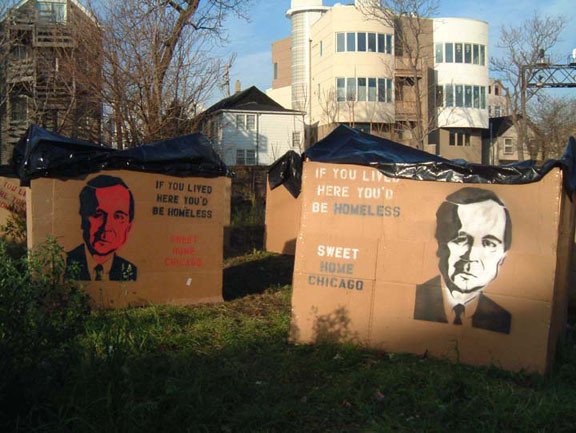 When the city of Chicago unveiled their latest corporate-sponsored public art project ‘Suite Home Chicago’ the project was ripe for a public intervention related to income inequality and affordable housing in the city. The result was Daley Village. Read an essay explaining the project here. ‘This is CHAos’ was a high-level public intervention and counter-PR campaign which threatened to implode the Chicago Housing Authority’s careful rebranding of its controversial public housing policies. It was made by an anonymous group, in consultation with public housing residents and other experts, who felt that the CHA’s ‘Plan for Transformation’ was in fact an engine of displacement, corruption, and privatization of public land and services. Listen to the short NPR radio segment about the Chicago Housing Authority’s ‘Plan for Transformation’ and the ‘This is CHAos’ intervention. I developed this series of public lectures alongside the Visiting Artist Program at SAIC and was co-conceived with Romi Crawford, Claire Pentecost, and Mary Patten. The invited lecturers included: Emily Jacir; Mark Bradford; Brian Holmes; Matthew Coolidge of CLUI; Ellen Gallagher; and Coco Fusco. There was also a lunchtime “Lunchbox Discussion” featuring local artists working on similar themes that included “Mapping Chicago” with Temporary Services; “Confronting Division and Difference: Artistic Practice in Eastern Europe and the European Union” with Elena Jovanova and Paige Sarlin; “Landscapes and Monuments” with Deborah Stratman and Ellen Rothenberg; and “Artist as Urban Planner” with Emily Forman and Eric Triantafillou. Public/Private Parties: Proposals for Reactivating Public Spaces (2010) – Video screening at CHIOSC in Chisinau, Moldova. Discount Cinema (2002): A short-lived Micro-Cinema curating collective that included screenings of Tony Conrad’s The Flicker and Anthony McCall’s Line Describing a Cone at Cinema Borealis; Series of screenings about social movements in Argentina and Brazil (2001-02) with Eye of the Storm Films at Buddy; Zack Stiglicz retrospective at Highschool. Dara Greenwald’s Ideological World Wrestling Federation performance at the Smart Museum. Since 1997 I have occasionally developed public experiments to interact with the landscape of cities like Chicago. 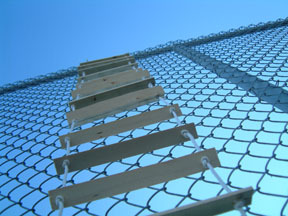 Including: Ladders; Rooftop with a View; Factboxes; GBGC Newspaper Boxes and Public Advertisements; Misc. Wheatpastes and Stencils; etc. Retooling Dissent screened in numerous festivals, exhibits and public events, and can be found on the Selectmedia DVD series, Blackedout Media TV, and in the Disobedience archive. 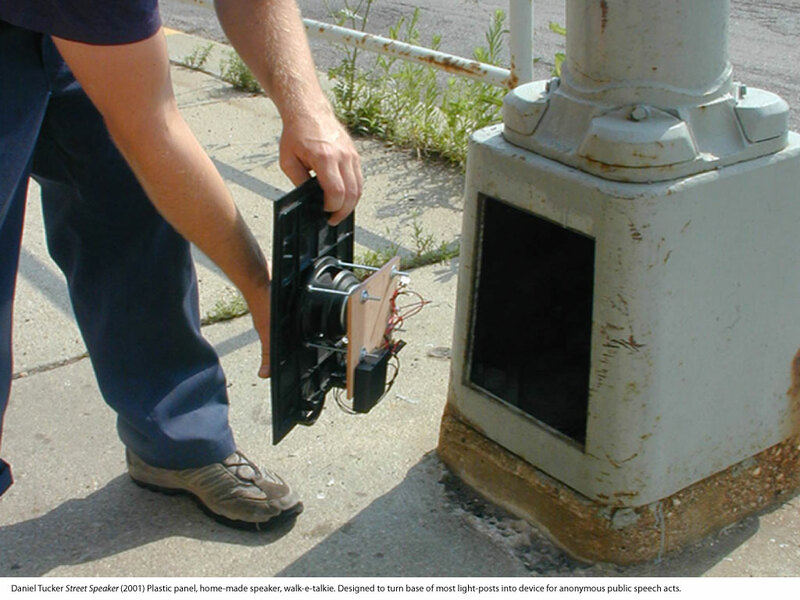 A streetlight panel wired with a homemade amplifier that can attach to a recording or a mobile 2 way radio for anonymous engagement on the street. StreetRec (2001-2003) was a short-lived Chicago activist media collective focused on graphics and video production. 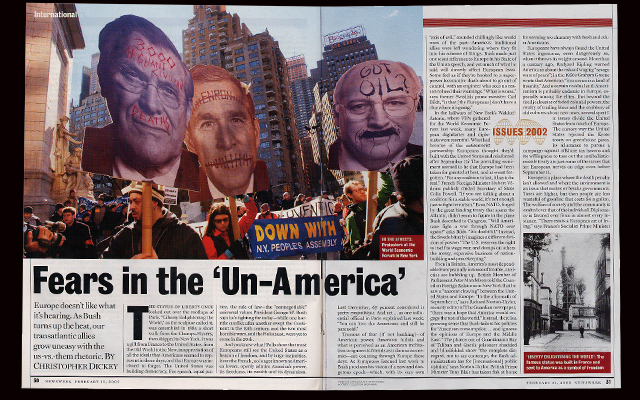 Our main collaborative output included the graphics known as “The Heads” for use at the World Economic Forum protests in 2002 and subsequent anti-war demonstrations. This work was documented in the widely screened video Retooling Dissent. This ad-hoc group of people continued to work together on other graphics campaigns including the Trans Atlantic Business Dialogue protests in Chicago in 2003. Some of those projects included a dis-invitation to the TABD meetings that explained the significance of these events in a manner that would engage a broad audience. Version>04: Invisible Networks and iNfo-eXpo Networking Fair at the Chicago Cultural Center and various locations (2004). The fair included booths by 16 beaver Group, Angels of Def, Animal Factory, Antigravity Surprise, Bike cart Info shop and Open Air Public Reading Room, Champaign Urbana IL , Charles H Kerr Publishing, Chicago Gray Line, Children’s Studio Presents, Chris Wildrick, Chronozone 2, College of Complexes, Cooperative Image Group, De Player, Chicago Drag Kings, FeelTank Chicago, Films and Cities, Free Walking, Genewise, Gentrification Board Game, Grand Rapids Michigan, Journal of Aesthetics and Protest, Locus, Lumpen, Microrevolt, The Network of Casual Art A/V Dept., The Neighborhood Writing Alliance, Las Non Gratas Class, Pilot trans-feminist TV festival, Quimbys, Red 76 Arts group, The Stockyard Institute, Temporary Travel Office,Toyshop Collective, and We The People Media. “BikeCartInfoShop and OpenAirPublicReadingRoom” was a platform for public literature dissemination created in 2004. Subsequently it was repurposed by Backstory Cafe and Free Geek Chicago. It was organized by Daniel Tucker and designed by Dave Grant, Michelle Faust and Dave Metcalf.